The introit is “Jesus, Name Above All Names” by Naida Hearn of North Palmerston, New Zealand. The practice files are attached. Naida Anita Hearn was born in 1931 and died in 2001. One source (hymnary.org) says she was born in 1944, but that can’t be correct. Simon Boroughs, who, in 1980-1983, attended the Pentecostal church where Naida Hearn played piano, believed the birth year of 1931 more likely. I just checked the New Zealand electoral rolls. The Palmerston North electoral rolls show that she was married and registered to vote in 1957, so she was certainly born before 1944. We knocked on the door and a little lady answered. We asked if she was Naida Hearn, to which she replied in the affirmative. We told her that we were musicians visiting from England and would very much like to talk to her. She told us her story… (about an unhappy marriage). But, Naida was an inspiration to those around her, and had her bible open on the table ready to lead a bible study among those in her community. She told us about writing her song, standing at the sink and having all the names of Jesus come into her head. She then sat down at her piano and played it with wonderful flourishes. She also shared with us that it wasn't sung correctly! A group of evangelists had taken her song to Europe but had taught it wrongly. She said that she felt that when (she) was singing about our Lord, the melody should never drop, so at the end of the first half of the song in the words 'Glorious Lord', the note on Lord should stay the same note and not go down! The words of the opening hymn, “Come, Thou Long-Expected Jesus” are by Charles Wesley. The tune is HFRYDOL by Rowland Hugh Prichard. HFRYDOL is one of the few hymn tunes that fits the pentatonic scale of the bagpipe particularly well. I would play it for you at some service, but I think I’ve outgrown my kilt. Rowland Hugh Prichard was a native of Graienyn, Wales, born 14 Jan 1811. He was a loom tender’s assistant in Holywell and died there 25 Jan 1887. His song book, “The Singer’s Friend” was written for use by children. “Hyfrydol” means “cheerful,” and was composed by Prichard when he was 20. The choir anthem is “To a Virgin Meek and Mild,” was authored by the Rev. Vigleik E. Boe and Oscar Rudolph Overby in 1935. Vigleik E. Boe was born in Odda, Hardanger, Norway, on 30 Mar 1872. He came to America in 1892 and went immediately to Minnesota. 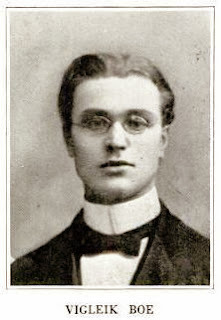 He was the student instructor of the St. Olaf Choir in 1898-99. In 1899 he was attending the United Lutheran Theological Seminary in St. Paul. Rev. V. E. Boe was the first pastor of the Norwegian Lutheran Church organized in Finley, North Dakota, in 1903, and he served there until 1909. Then he went to Staten Island. He returned to Finley and became the pastor again in 1917 and served until 1941. He retired in 1940 and returned to Northfield, Minnesota, where he died on 08 Jun 1953 in Dennison, Minnesota. He is buried in the Vang Lutheran Church Cemetery in Dennison. His daughter Gertrude Boe married Oscar R. Overby in August 1923. So the words and arrangement are by Boe and his son-in-law, Overby. Oscar Overby was born 30 Sep 1892 and died 17 Jun 1964 in Northfield, Minnesota. The tune is: "EL DESEMBRE CONGELAT" is a Catalonian Carol. Some sources give the name of the tune as: "LO DESEMBRE CONGELAT"
http://youtu.be/MuqQpJdIyIw “El Descembre Congleat” performed in San Francisco at the Presidio Interfaith Chapel by a male choir. Next, Jason Neal will light the first Advent candle, which for this year’s Advent at Old South Haven is the Candle of Hope. At some point during this part of the service, the choir will sing a bit of the Don Besig/Nancy Price anthem “Candles of Advent” (1997). 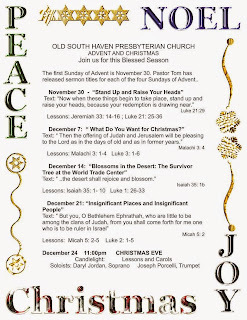 The Old South Haven Choir first sang “Candles of Advent” in 2003. It has a flute accompaniment, which Ann would play on her recorder. We also sang it in 2007, 2011, and probably in many other years. The anthem isn’t arranged as one set of notes which are repeated for each verse. There aren’t “verses” per se. The score varies, especially in the flute accompaniment, as the part for one candle after the other is sung. So the anthem’s sequence is without Joy (thus, no requirement for the PINK candle) while the sequence used by Rev. Philipp is without Faith. Interestingly, at the conclusion of the anthem (p. 14), where the four candles are reviewed, only the men sing about the candle of faith. One year we thought about making up our own words to replace the part about the Candle of Faith with a part about the Candle of Joy. “Hope, Faith, Love, Peace” does seem like a more natural progression. The Old Testament lesson is from Jeremiah, Chapter 33, verses 14-16. The verses record a bit of what the Lord, Yahweh, spoke to Jeremiah. The Lord affirmed that “the time will certainly come” when He would “raise up a righteous descendant of David” to restore the nations of Israel and Judah. “Under his rule Judah will enjoy safety and Jerusalem will live in security.” If the prophecy is seen as a reference to the time Jesus was on the earth, I guess one might say that Judah did enjoy safety and Jerusalem did live in security --- under the Pax Romana. The Protestant Old and New Testaments give the names of only five angels. The three bad ones are: Abaddon, Beelzebul, and Satan. Abaddon, “The Destroyer,” was the king of an army of locusts and The Angel of the Abyss. Beelzebul, “Lord of the Flies.” In the Testament of Solomon (written sometime between 1 A.D. and 400 A.D., Beelzebul appears as the leader of the demons. Even though only five are named, we know there was a “host of angels” and Michael was the Prince of the Heavenly Hosts, and actually not just an angel, but an Archangel. There are more named angels in other Bibles that include more or different books than the Protestant Bible. In the Book of Tobias (Tobit) there is Raphael. He’s one of the seven who stand before the Lord. The Book of Enoch, which is in the Bible of the Oriental Orthodox Church of Ethiopia, includes four more angels, Raguel, Remiel, Saraqael, and Uriel. These four, along with Michael, Gabriel, and Raphael, are said to be the seven angels who stand before the Lord. The Latter-Day Saints have the Angel Moroni, who sits atop the Mormon temples. Moroni visited Joseph Smith regularly when he was in New York, beginning on 21 Sep 1823. The Mormons believe in three types of angels, but none are to be worshipped, prayed to, or venerated. Oddly, the Mormons do not believe that angels actually have wings. Whenever they are represented as having wings, the wings are merely a symbolic way of expressing some characteristic of angels (mobility, majesty, or whatever). The second hymn is “O Lord, How Shall I Meet You?” with words authored by Paul Gerhardt in 1653 and translated by Catherine Winkworth in 1863. The tune is VALET WILL ICH DIR GEBEN (“I Want to Bid You Farewell”) and was composed by Melchior Teschner in 1614. Melchior Teschner was born in Fraustadt, Poland, on 29 Apr 1584. He was a German singer, composer, and theologian. It is not at all pleasing to me. Those who serve Him here. “All Glory, Laud and Honor” is sung to the same tune. J. S. Bach used the melody to write a chorale, BWV 736. The closing hymn is Swedish, “Prepare the Way (Bereden väg för Herran),” authored by Frans Mikael Franzèn. Frans Mikael Franzèn was born in what is now Oulu, Finland, on 09 Feb 1772. He was a librarian and a professor of Literary History, then a pastor in Sweden. He became Bishop of Härnösand in 1834. He died in Härnösand, Sweden, on 14 Aug 1847. The words were set to an old Swedish melody dating from before 1560. “Lo! He Comes with Clouds Descending” is the prelude, or rather a tune used with that hymn is the prelude. I think this same tune sometimes goes by the name ST. THOMAS (Wade). The tune has by some been attributed to others. John Wade was born in 1711. He was an English Catholic and fled to France after the Jacobite Rebellion failed in 1745. 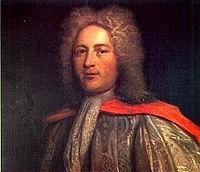 He lived in France the rest of his life and died there on 16 Aug 1786.
http://www.hymnary.org/media/fetch/148549 “Lo! He Comes with Clouds Descending,” tune HOLYWOOD or ST. THOMAS, attributed to John Francis Wade. The offertory piece is “Christ Jesus Who Maketh Us Glad (Christ qui nous rend heureux)” by Marcel Dupré. It is one of his seventy-nine chorales for organ which Dupré wrote to teach organists how to play Bach chorales. It must a melancholy sort of gladness. It is also a short piece. “Come, Ye Thankful People Come” is the opening hymn (No. 551). The choir sang this as an anthem for Thanksgiving Sunday in 2011, so we already know how to sing it in parts. The tune is by George Elvey. He was born in Canterbury, England on 27 Mar 1816. As a boy, he sang at Canterbury Cathedral. Then he attended the Royal Academy of Music. Around 1835, he was ap­point­ed “mas­ter of the boys” and or­gan­ist at St. George’s Cha­pel, Wind­sor, Eng­land, from which the tune for this hymn gets its name. The words are by the poet Henry Alford (b. 07 Oct 1810, Bloomsbury, England; d. 12 Jan 1871) who was a fifth generation Anglican clergyman. He had written several odes in Latin before he was ten as well as a history of the Jews. He attended Trinity College, Cambridge. Wikipedia says he might have had a great reputation as a scholar and preacher if he hadn’t dabbled in minor poetry and magazine editing. Alford was ultimately advanced to the “deanery of Canterbury” where he remained until his death. He was also a very good artist. You can see his sketches here: https://archive.org/stream/rivierapenandpe01alfogoog#page/n12/mode/2up The Riviera: Pen and Pencil Sketches from Cannes to Genoa. The choir anthem is “We Praise Our God” by Ruth Heller, set to the tune of Finlandia by Jean Sibelius. The Gospel reading is Matthew 25:14-40. The first part is about not being too conservative when you are entrusted to invest someone else’s money, as that person expects to get a good return. It seems to be rather radical advice on how to handle something valuable that isn’t yours, but perhaps that’s the point. The next part is more interesting as it got me to thinking, why does a shepherd separate his sheep from his goats? Although I grew up on a farm, we had neither sheep nor goats, though we did have cattle, hogs, chickens, ducks, and guineas. I think it was not uncommon, even in America, to run sheep and goats in mixed herds. I expect it was necessary to separate them when it came time to milk them. After all, goat cheese and cheese made from sheep’s milk do not taste the same. So you couldn’t use the same milk bucket for both the sheep and the goats, at least not at the same time, so it was probably prudent to separate the sheep and the goats before you started milking. I would sit on the floor and turn and turn the handle and watch the cream turn into butter. It was more fun than playing with my toys. Another question is why did the writer of these verses identify the righteous with the sheep? The other reading, 1 Thessalonians 5:1-11, is the same reading we had on November 16. The second hymn is “Now Thank We All Our God,” by Martin Rinkert, 1636.
http://youtu.be/8LA6WMCgapU “Nun Danket alle Gott” sung by Günter Wewel and a choir in an Austrian Protestant church, Kirke St. Martin. The closing hymn is “Let All Things Now Living” by Katherine Kennicott Davis, sung to the tune ASH GROVE, a Welsh tune. Katherine K. Davis often used a pseudonym when writing text for music. For this one, which she wrote in the 1920s, specifically for this tune, she used the pseudonym John Cowley. She was born on 25 June 1892 in St. Joseph, Missouri; 34 miles north of the farm where I grew up. Her parents were Maxwell Gaddis Davis and Jessie Foote Barton. She attended Wellesley College, graduating in 1914. Her post-graduate years were spent at the New England Conservatory of Music. Katherine Davis taught music at Concord Academy in Massachusetts and at the Shady Hills School for Girls in Philadelphia. When she wrote “The Little Drummer Boy” she used the pseudonym C. R. W. Robertson and titled it “The Carol of the Drum.” The Trapp Family Singers made it famous. She died 20 April 1980. Here is a high quality recording of it by the Lebanon County Youth Chorus singing “Let All Things Now Living,” a cappella. The prelude is “Lobt Gott, ihr Christen, allzugleich (Praise God, You Christians, All Together” by J. S. Bach. The offertory is “Prayer” by William Dawson Armstrong. This was also the offertory piece on 06 Apr 2014. I think he looks a bit like David Suchet, the actor who play Poirot. William Dawson Armstrong was born 11 Feb 1868 in Alton, Illinois. His father, William Armstrong, was a life-long opponent of slavery and a Methodist. William Armstrong married Mary E. Parker in 1867. William Dawson Armstrong was educated in the Alton schools, then by various teachers in Alton, St. Louis, and Chicago. He was then instructor at Forest Park University for Women in St. Louis from 1891-1892. He was organist at First Baptist and St. Paul’s Episcopal in Alton, then at the Church of the Redeemer (Episcopal) and the Church of Unity in St. Louis. He died 09 Jul 1936 and was buried in the Alton cemetery. I couldn’t find any of his works on YouTube. “Song of Triumph” by James H. Rogers is the postlude. It was also the postlude on 06 Apr 2014. I wasn’t able to find out much about this work, except that it was played on Independence Sunday at the Methodist Episcopal Church in Miami, Oklahoma, in July 1935. “Song of Triumph” was published in “The Chapel Organist” in 1934. It is difficult to trace James H. Rogers as there were two contemporaries, James Hotchkiss Rogers (7 Feb. 1857-28 Nov. 1940) and James Henderson Rogers who were both organists and composers. He became the organist and choirmaster at St. Anne’s in Brooklyn at age 19. He also served as organist and choirmaster of Trinity Church, Saugerties, in 1891. He was born in Newark, New Jersey. 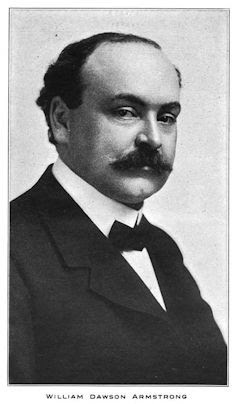 This James H. Rogers also wrote a play: “The Heir Apparent,” a comedy-drama in four acts in 1908, while he was living in Saugerties. James Hotchkiss Rogers was a Cleveland composer. He was born in Fair Haven, Connecticut on 07 Feb 1857 and was the son of an Episcopal priest, Martin Lorenzo Rogers and his wife Harriet Elizabeth Hotchkiss. The family moved to Chicago when he was 13. He studied organ for three years in Paris with Alexandre Guilmant and composition with Charles-Marie Widor. He moved to Cleveland in 1881. In 1933, he retired with his wife to Pasadena, California. He died there on 28 November 1940. Text: "Now concerning the times and the seasons, brothers and sisters, you do not need to have anything written to you." 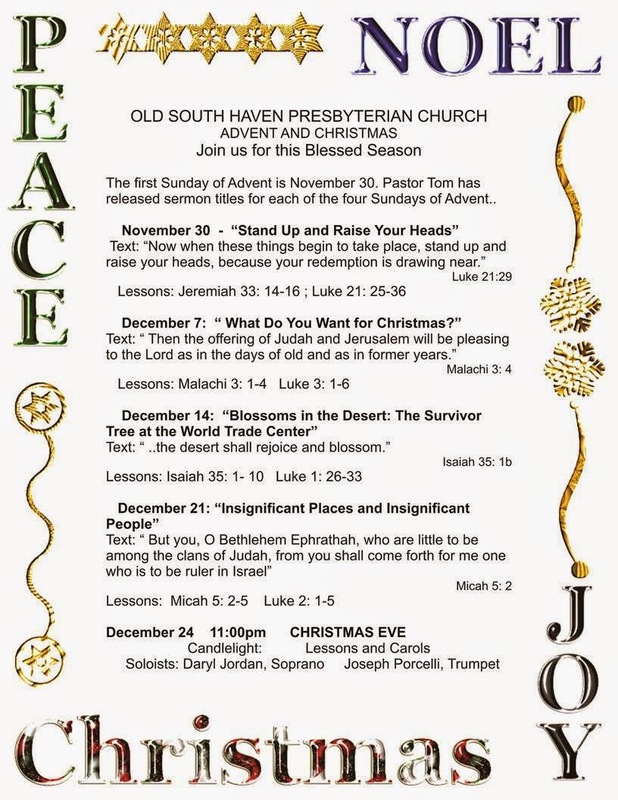 Sermon: "Stand Up and Raise Your Heads"
Text: "Now when these things begin to take place, stand up and raise your hands, because your redemption is drawing near"
Sermon "What Do You Want for Christmas? Text: Then the offering of Judah and Jerusalem will be pleasing to the Lord, as in the days of old and as in former years"
Sermon: "Insignificant Places and Insignificant People"
Text: "But you, O Bethlehem Ephrathah, who are little to be among the clans of Judah, from you shall come forth for me one who is ruler in Israel"
COLLECTING TOYS We are collecting toys to be distributed through Thursday's Child. Don't forget older children as well as youngsters. The Introit is “We Come Before Thee,” the same as last week. We have this piece as an anthem by John Rutter. Alan likes it a lot, but it is one of the hardest pieces we’ve done. http://youtu.be/PTOfSKXkRa0 John Rutter’s “For the Beauty of the Earth,” Vocal Arts Academy of Milwaukee, Emily Croker, director. And here it is at a fast tempo in a different language, Portuguese I think. The words were written by Folliott Sandford Pierpoint (b. 7 October 1835, Spa Villa, Bath, England, d. 1917) in 1864. He attended Queen’s College, Cambridge. He was a High-Church Anglican which developed into Anglo-Catholicism. He was a member of the Tractarian Movement. 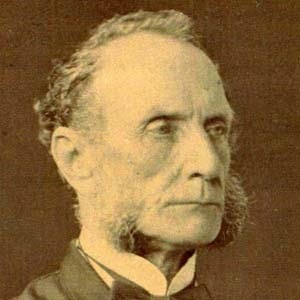 The Tractarians were sometimes called Puseyites (by their detractors) after one of their leaders, Edward Bouverie Pusey. 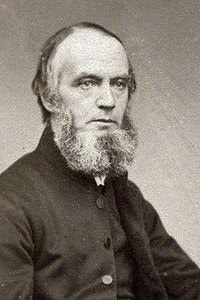 Pierpoint was 29 when he wrote the words of the hymn. They first appeared in Lyra Eucharistica, Hymns and Verses on The Holy Communion, Ancient and Modern, with other Poems. The tune is DIX (Kocher) by Conrad Kocher; (b. 1786, Ditzingen; d. 1872, Stuttgart) with alterations by William Henry Monk. The hymn “As with Gladness Men of Old” is often sung to the same tune. The readings are from Judges 4:1-7 and 1 Thessalonians 5:1-11. I have been told that Rev. Philipp will be preaching his first sermon ever based on passages from the Book of Judges. It will be a premiere. Deborah was the leader of Israel at the time, and she had to decide what to do about General Sisera and his nine hundred chariots with iron-rimmed wheels who was oppressing the Israelites for his King, King Jabin of Canaan. She calls up Barak and orders him to go up with the Israelite army and attack General Sisera, and tells him first to march up to Mount Tabon. Barak says, I’ll go, but only if you go with me, so she does. General Sisera learns of their approach and “ordered all of his chariotry --- nine hundred chariots with iron-rimmed wheels – and all his troops” to go to the River Kishon. Well, one survived, as General Sisera jumped out of his chariot, and ran away on foot. He made it to the tent of Jael, the wife of Heber. Jael comes out and tells him to “Stop and rest. Don’t be afraid.” Sisera stops, goes into the tent, and Jael puts a blanket over him. Then Jael took a tent peg in one hand and a hammer in the other. She crept up on him, drove the tent peg through his temple into the ground while he slept from exhaustion, and he died. All-in-all, it was a pretty bad day for General Sisera. Barak learns of what has happened and Deborah and Barak sing a victory song. her right hand for the workmen’s hammer. she drove the tent peg through his temple. Unfortunately, the Bible doesn’t tell us the tune to which these words were sung. and his desire to deliver is like a helmet on his head. There is also the hymn “Praise ye the Lord, who hath avenged” by John Barnard of Marblehead, Massachusetts, which he published in 1752, and has the following 26th verse (well, it is a long story): “She took the tent nail in her hand, Her right hand seized the hammer fast; Through Sisera's temples drove the spike, And then cut off his head at last.” Luckily in Marblehead, in 1752 the Puritans had long services, as it must have taken quite a while to get through all 31 verses. Anyway, we’ll be singing No. 426, “Lord, Speak to Me that I May Speak.” This year, we’ve sung that hymn on May 11, June 22, and August 24. The tune for “Lord, Speak to Me, that I May Speak,” CANONBURY is derived from the fourth piano piece in Robert A. Schumann's Nachtstücke, Opus 23 (1839). Robert Schumann (1810-1856) intended to be a concert pianist, but he injured his hand, and turned to composing instead. He attempted suicide in 1854 and, at his own request, “was confined to a mental institution,” where he spent the last two years of his life. We sang that one on July 6 and October 12. It’s sung to the AUSTRIAN HYMN by Haydn, the tune for the national anthem of Austria and of Germany, about which I have written more than enough already. The prelude is “Andante Religioso” by Henry Smith. I found the sheet music on the internet, but I didn’t find an audio file. But as I had the sheet music (copyright 1916), I just fed it into SmartScore and produced a MIDI file, attached. It sounds good as a piano piece too. I may have missed some accidentals. There were quite a few. The offertory is “Chanson Mantinale” by Richard Lange. The postlude is “Marche Triomphale” (“Triumphal March in E-flat Major”) by Paul Wachs. Stephen Victor Paul Wachs was born in Paris, 19 Sep 1851, and died 06 Jul 1915, Saint-Mande. He studied organ at the Paris Conservatory with François Benoist, then with César Franck. He was the organist at Saint-Merri Church form 1874 until 1896. The introit is “We Come Before Thee,” the practice files for which were distributed on June 2, 2014. The author/composer of the piece is shown as James Denton, but James Denton was just a pseudonym. The introit is actually by Dr. Robert J. Hughes, who also used the aliases of John Johnson and James Moffatt. He’s buried in Greenville, South Carolina, where his grave stone declares that he has been “Promoted to Glory.” There is also a treble clef and some musical notes on the stone. I don’t know why hymn writers use pen names. It could be worse, Charles Gabriel, who composed the music for “Higher Ground” and wrote “I Will Not Forget Thee” and “He Lifted Me” sometimes used the pen name Charlotte G. Homer. The opening hymn, Hymn No. 477 “Ye Servants of God, Your Master Proclaim,” is one of the many hymns authored by Charles Wesley (1707-1788). He wrote this one in 1744. It is sung to the tune HANOVER in the Presbyterian Hymnal. We sang the hymn on August 18 last year and again on August 31 this year. http://youtu.be/fawNNvEyQIQ “Ye Servants of God, Your Master Proclaim,” sung by the Mount Ensemble Male Voice Choir. The choir is made up of men who live in and near St. Thomas Mount, a village on “a small hillock in Chennai, Tamil Nadu, India.” They sing in Tamil as well as English. The tune, HANOVER, was written by William Croft (1678-1727) in 1708. He was educated at the Chapel Royal, which is not under the Archbishop of Canterbury of the Church of England. It is instead part of the Ecclesiastical Household of the monarch. In 1707, William Croft became the “Master of the Children” of the Royal Chapel. He also composed some music for the funeral of Queen Anne in 1714 and for the coronation of King George I in 1715. This is a bit different from the advice of Fleetwood Mac, who sang “Don’t stop thinking about tomorrow, yesterday’s gone, yesterday’s gone,” but Fleetwood Mac was also advocating a positive outlook --- Yes, the recent past may have been pretty awful or something you valued greatly, such as a relationship, is now no more, but yesterday’s gone, so don’t burden yourself being sorrowful with what has been lost or what might have been, instead, keep looking ahead; focus on tomorrow. The gospel passage says that for those who place pursuing righteousness and the kingdom of God above all other concerns, everything needed will be provided. So the passage from Matthew advocates living in the present with an attitude of confidence. Don’t fret over what the future may bring. The disciples are told to believe that God will provide --- don’t worry. Of course, that leaves open the question of how “pursuing righteousness and the kingdom of God above everything else” is to be defined, and what measures one might employ to determine whether one was doing so. I expect there is a wide difference of opinion regarding what “righteousness” is, as well as how it is to be properly pursued. Thus it would seem there’s something to worry about after all. The second hymn is “Seek Ye First,” and goes with the theme of the Gospel lesson, Matthew 6:19-34. The tune for this hymn, LAFFERTY, was composed by Karen Lafferty in 1972. She also paraphrased the words from the gospel and set them to the tune. Karen Lafferty was born in Alamogordo, New Mexico, in 1948, where she was also raised. Karen Lafferty has a Bachelor of Music Education degree from Eastern New Mexico University. As a nightclub entertainer working in the area of Costa Mesa, California, she “began witnessing to people in the bars.” Then she switched to recording Christian music. In 1995, she returned to the US and lives in Santa Fe, New Mexico. Here is an a cappella version of “Seek Ye First” with a descant. The closing hymn is “Lord of All Good,” No. 375, which is sung to the tune TOULON. The words are by Albert F. Bayly (b. 06 Sep 1901, Bexhill on Sea, Sussex, England; d. 26 Jul 1984, Chichester, Sussex, England). He attended London University and Mansfield College, Oxford; then was the pastor at Congregational churches in Northumberland, Lancashire, and East Yorkshire. After retirement in 1971, he lived in Chelmsford and was active in a United Reformed Church. The same tune is used for “I Greet Thee Who My Sure Redeemer Art,” and in the green 1933 Presbyterian Hymnal, it was used for “God of the prophets, bless the prophets’ sons,” which no one sings anymore. I did find “Lord of All Good” on YouTube, but the hymn was being sung to MORESTEAD, FARLEY CASTLE, WOODLANDS and other tunes --- not TOULON. The prelude is by Felix Mendelssohn, sometimes known as Felix Mendelssohn-Bartholdy, Bartholdy being his mother’s maiden name. 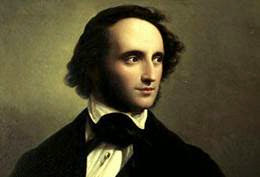 Mendelssohn died at age 38. Schumann was one of the pallbearers. It isn’t entirely clear to which of Mendelssohn’s compositions “Andante” refers. 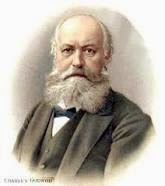 The offertory piece is "Offertorium" by Charles-François Gounod. Kyrie, Gloria, Credo, Offertorium, Sanctus, Benedictus, Agnus Dei, Domine salvum. The postlude is "Menuet" from Fantasy for Piano, Op. 78 by Franz Schubert. 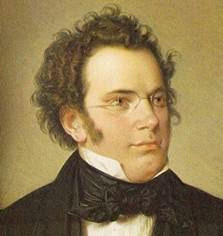 Schubert died at age 31. How do pianists memorize all those notes? This piano sonata is forty minutes long, but I have set the link to start at the third movement (“Minuetto”). Most professional players of the instrument have tired of always being asked the question, but some hold particularly strong views, usually in favor of flutist over flautist. The etymological evidence offers little support for flautist in English-speaking countries, but many written works now seem to prefer this term.